A replica of a leading British public school in Dorset is to be created in an Arab emirate. Emir Sheikh Hamad bin Khalifa Al-Thani is funding the multi-million-pound plan to open a branch of 500-year-old Sherborne School in Doha, Qatar. 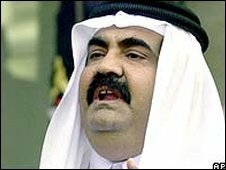 Sheikh Hamad's son, Qatar's crown prince, is a former pupil. 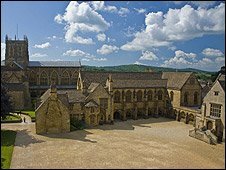 The replica, which will be modelled precisely on the Sherborne buildings but without the abbey due to Islamic traditions, will be completed by 2012. Professor Richard Hodder-Williams, chairman of the school's governors, said: "In these days, any school that is modern and in tune with its pupils' needs, must engage with the world outside its own home. "So I am delighted to announce that Sherborne has been selected by the Supreme Education Council in Qatar to establish a branch campus this coming September. "This will be a partnership with a member of the Qatari royal family, several of whom have received some of their education either at our International College or at Sherborne itself. So we know we get on well. "The project will enable us to give to one of the most progressive states in the Middle East our educational expertise to enhance their development just as it will provide for us a regular income to support our growing bursary fund." The co-educational school will be open to all nationalities from years six through to 13. Pupils will follow the English national curriculum, in addition to Arabic and Islamic studies, in the purpose-built campus. All pupils will wear the traditional uniform known as the school's Blues and fees paid by Qatari pupils will help pay for bursaries to the Dorset school. Former pupils of the £24,000-a-year school include novelist John le Carre, Oscar winning actor Jeremy Irons and Coldplay front man Chris Martin.